Ohio has a rich history and a bright future in the oil and gas sector. Tradesmen and women from around the state have helped build Ohio’s oil and gas infrastructure, helping to provide much needed energy and fuel not only locally, but throughout the Midwest; and Ohio is home to four petrochemical oil refineries. 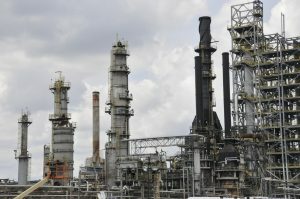 Marathon Petroleum Corporation’s Canton refinery produces 80,000 barrels per day (bpd). It takes sweet and sour crude oils and produces gasoline, distillates, asphalt, roofing flux, propane slurry, and sulfur. The PFB Toledo refinery has a throughput capacity of approximately 170,000 bpd. It processes light and sweet crudes from Canada, the Mid-continent, the Bakken region, and the U.S. Gulf Coast and turns them into numerous products including gasoline and ultra-low sulfur diesel. Major units at the refinery include an FCC unit, a hydrocracker, alkylation unit, and UDEX unit. The Husky Lima Refinery produces gasoline, diesel, jet fuel, residual fuels, and petrochemical feedstocks. The refinery produces approximately 152,000 bpd of refined petroleum products, including approximately 25 percent of the gasoline consumed in the state of Ohio. Our affiliated members successfully conducted maintenance and equipment upgrades at the refinery. The BP-Husky Toledo Refinery is a joint venture project between BP and Husky Energy, which provides the Midwest with gasoline, diesel, jet fuel, propane, and asphalt. The refinery can process up to 160,000 barrels of crude oil each day. During the summer of 2016, the refinery underwent its largest maintenance turnaround in 40 years and the through a National Labor Agreement, union tradesmen and tradeswomen successfully worked on the facility, upgrading equipment. The turnaround was finished on time and on budget within all total work completed. ACT Ohio members, through National Labor Agreements and Project Labor Agreements, are building natural gas-fired power plants throughout the state, producing oil and gas close to home. 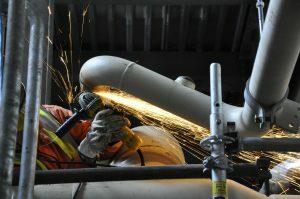 An ACT Ohio member grinds a weld on a pipe at the Oregon Clean Energy Plant. An 800 megawatt (mw) Oregon Clean Energy plant, located in Oregon, Ohio, went online on July 1, 2017. Construction on the $850 million project was completed on time and on budget. Plant owners are currently in the planning stages of building a second plant in Oregon and will be using ACT Ohio members to build that facility. A 700 mw plant in Carroll County will provide electricity to approximately 750,000 homes. Situated in eastern Ohio near the Marcellus and Utica shale formations, the $899 million plant should be completed by the end of 2017. In southwest Ohio, the NTE Energy facility is scheduled to go online in 2018. Situated in Middletown, the 525 mw plant will provide power to 400,000 homes and will cost around $500 million to build.